This activity is co-organized by the Université de Montréal (Faculty of Law / LR Wilson Chair / CRDP) and the Chinese Academy of Social Sciences (CASS). This conference represents a new activity between the two institutions that are used to working together. 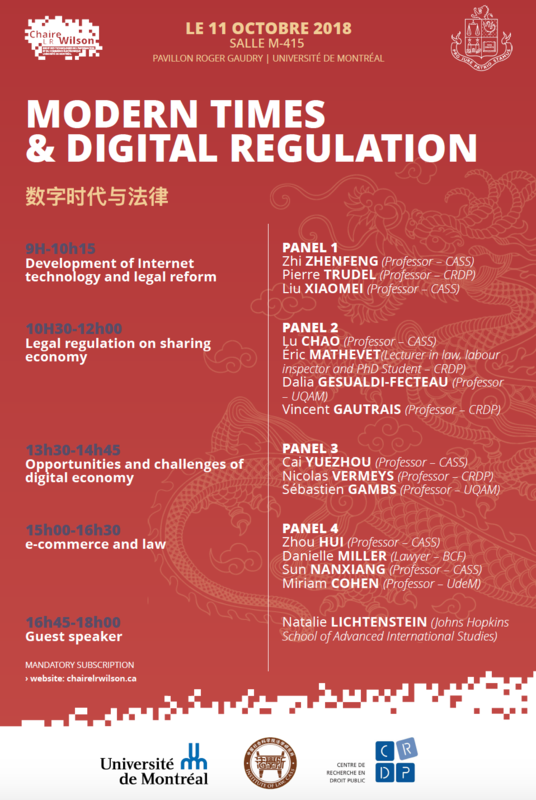 This year, the conference is titled « Modern Times and Digital Regulation » and will discuss a comparative view of the legal issues surrounding e-commerce. The event is free for students and academia; please register below. Otherwise, the registration fees are 200$ (taxes included). To make a payement please click here. Ce contenu a été mis à jour le 10 octobre 2018 à 17 h 28 min.